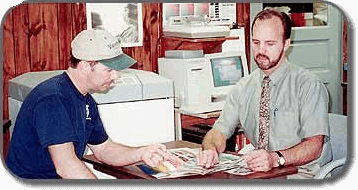 Customer Service | Sault Printing Co.
Sault Printing Company has been in business since 1969! We are the leading provider of Printing, Office Equipment, and Office Supplies to the Sault Ste. Marie, MI Area. 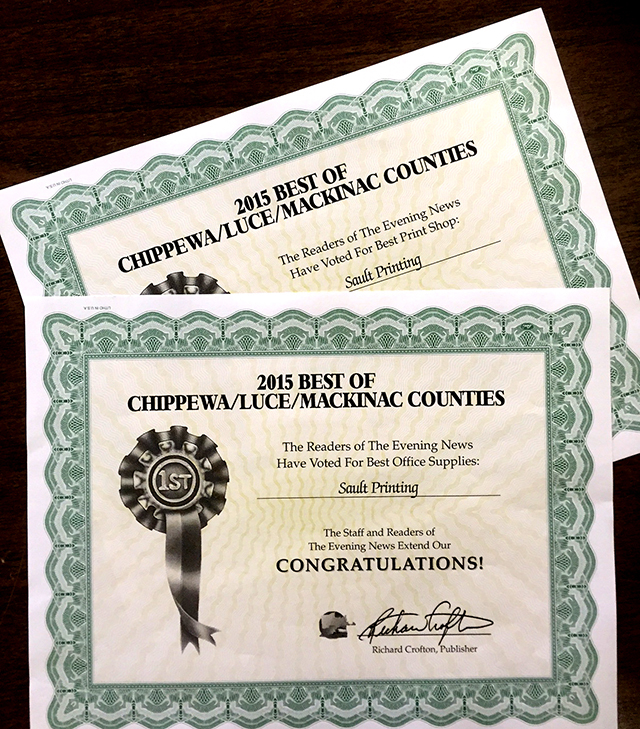 Sault Printing has many years worth of awards! When you place an order at Sault Printing, you can rest assured you will receive personal service and expert guidance right from the start. Our staff will assist you in choosing paper stock, layouts, colors, photos, and styles for your printed piece. Once the preliminary specifications have been determined, you'll be provided with an estimated price and turnaround time. Your salesperson will then help you through the proofing process and will be available at every step of the process to answer your questions or concerns. Sault Printing offers unique additional services to its customers. A sales representative will visit your business, take pictures, help with layout and design choices, answer questions, and give you an estimate-all at your place of business-saving you time and travel. Our sales staff covers the Eastern Upper Peninsula and parts of Northern Lower Michigan. Appointments can also be made for other areas. Convenient, timesaving electronic proofs are available by e-mail and a special "rush" service can be arranged to put your project on the ultra-fast track. A successful print job is a team effort which involves not only the customer and the salesperson, but all personnel in every department as the job progresses. From start to finish, the goal is to produce exactly what you, the customer, have in mind. Paul Ignatowski assists a customer in the planning and layout of a brochure. Paul's background in art and computers enables him to harmonize the desires of the customer with the requirements of the printing process. If at any time you have a question or concern about your order, our sales staff is always available-by phone, mail, e-mail, fax or in person. It is this type of personal service, together with the quality of our products, that sets Sault Printing apart from the rest.